While Alexis is in New York trying to woo Mark Jennings, Adam is running the show at Colby Co and is instantly butting heads with Jeff. Thanks to Cecil's attorney, Gerald Wilson, Jeff learns that Adam made a deal with the Ahmed brothers. Unable to reach Adam, Jeff rushes to Alexis's office to find Adam and tell him that the deal with the Ahmeds is off. Adam does not like being old what to do, especially from an individual who works at Denver Carrington. It does not matter, Jeff owns 50% of Colby Co. and the deal is off. Mark is playing hard to get with Alexis. Alexis has no choice but to meet Mark on the tennis courts where he woos all the young ladies. Alexis convinces Mark that the divorce to Krystle was never filed so they are still legally married. Mark cannot understand why Krystle would still want him. 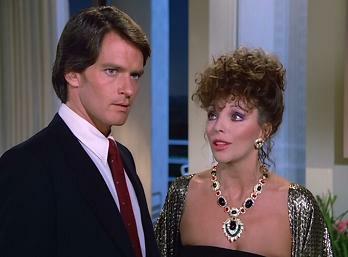 Then, Mark starts having fantasies of Krystle, of their time together (the best being when Mark took Krystle's virginity, on their wedding night, of course), when Linda Evans had the hair style that she had on the Big Valley (It is awesome that flashback scenes with female characters only requires a hair style change). Matters get worse for Mark when his clients start looking like Krystle. Fantasizing of Krystle, Mark shows up at La Mirage (no longer called La Mirada) and offers himself to be Fallon's tennis pro. Fallon is about to sign a deal until she sees a picture of Krystle in Mark's possession. Fallon accuses Alexis of bringing Mark out to Denver on purpose. Alexis was not aware that Mark actually came to Denver - Alexis was not as unsuccessful as she thought. Alexis even has greater news for Fallon - that Mark and Krystle were never divorced. Fallon is warming up to the idea of having Mark as the tennis pro. After the disaster of a dinner, Blake tries to smooth things over with Adam by taking him to lunch in this sweet red sports car. Can you imagine Blake in a sports car? It turns out to be a gift for Adam, but Adam refuses to take it - not until Blake can accept that Adam is his son. Fallon chastises Adam for being an ingrate - you never turn down a car from father - and being so rude to Blake. Fallon is still disturbed that she actually had sexual feelings for her brother and the situation is not helped by Adam who tells Jeff that Fallon threw herself at him (not true) - which Jeff seems to willing to accept. Krystle sees the pain that Blake is going through accepting Adam and believes the cause is Fallon. Since Fallon cannot accept Adam as her brother, Blake suspects that Fallon may be correct. Krystle tells Fallon to give Adam a chance, for Blake's sake. Fallon will not and pulls the blood line routine. Krystle is not taking it anymore - even if Fallon does something that harms Blake, Krystle will do everything in her power to stop her. Go Krystle! Did you know Joseph had a daughter - well he does (and a couple more children we don't learn about until Season 8) and she is at the Sorbonne and engaged to a wealthy Frenchman. No longer engaged, actually, which is why Joseph needs to quit his position and go to France and stay with Kirby until she marries that man. Blake will not allow it and even calls Joseph a snob. Joseph, a snob? Couldn't be. Instead, Blake invites Kirby to come stay at the mansion. Jeff learns that Adam fired Gerald Wilson because Wilson told Jeff about the Ahmed deal. Alexis cannot believe that Adam would do such a thing and instantly agrees with Jeff that he should have his job back. And, it gets better for Adam, Jeff is leaving Denver Carrington and will run Colby Co. along with Alexis. Adam is less than thrilled (Alexis loves it) and claims Adam to be the enemy. Alexis informs her son that she will determine who is the enemy. Alexis: How about dinner, tonight, in my hotel room? Mark: I'm not hungry. In fact, Mrs. Colby, when it comes to you, I'm on a diet. Fallon: Well, that's very flattering from my brother of all people. Blake [to Joseph]: You know sometimes, old friend, you're a snob. Adam: I know him. You see I learned very early in life how to tell my enemies from my friends and Jeff Colby is the enemy, mother. Our enemy - mine and yours. Alexis: Let me tell you something Adam, and don't you forget. I wouldn't be where I am today if it wasn't for the fact I know who my enemies are and how to destroy them. I'll decide if Jeff Colby becomes a real threat - not you - I.